Move over espresso martinis, there’s a new drink trending on the Brisbane scene, and it’s the summertime jam our lives have been missing for way too long. 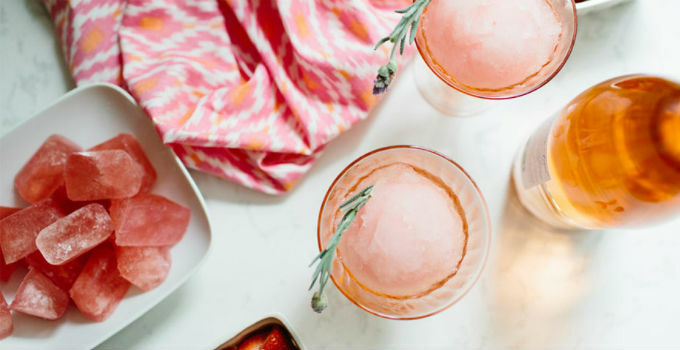 You may never be able to get enough of the fruity rosé-based slushie that is frosé, but with this recipe, you’ll be able to quit complaining about summer, and start wining. Warning: may result in a sudden influx of house guests and party invitations. Pour rosé into a 30 x 20cm pan and freeze until almost solid (it won’t completely solidify due to the alcohol), at least 6 hours. Scrape rosé into a blender. Add lemon juice, ½ cup strawberry syrup, and 1 cup crushed ice and purée until smooth. Transfer blender jar to freezer and freeze until frosé is thickened (aim for milkshake consistency), 25–35 minutes. Save time: Rosé can be frozen 1 week ahead. Say hello to a summer of frosé. Recipe adapted from Bon Appetit. Image by Erin McCinn.